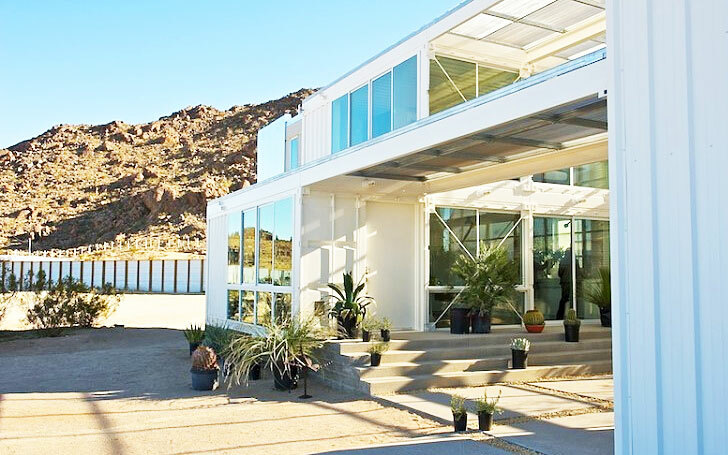 The Mojave Desert has joined other locations around the world in welcoming shipping containers into its architectural fabric starting with this breathtaking beauty of a home. Architect Walter Scott Perry, Principal of Ecotech and engineer Erinc Engheben, President of 44 West Construction have recently finished the hybrid house (a.k.a. the Tim Palen Studio) at Shadow Mountain near Joshua Tree, California. The 2,300 sq ft one bedroom residence was constructed at half the cost of other locally available prefab alternatives and exceeds California’s strict energy code requirements by 50 percent! The spacious two-story hybrid home was adapted to fit the media client’s needs with a separate photo studio and a large storage building on either end of the main structure. Ecotech built the residence using recycled steel and five 20’ long repurposed ISO cargo containers, a solar shade canopy to protect the home from the desert extremes, a 10,000 gallon storage tank and a Butler pre-engineered building all integrated with a steel framing system that provides the ultimate protection from earthquakes, fires and strong winds. The beautiful residence in the heart of the desert is a green living machine contributing more to the environment than just its looks. A movable living roof with bolt and add-on modules uses greywater irrigation and native plant species to absorb the heat, dust and CO2 produced by the desert environment. While it may seem a bit unsustainable to build in the desert, the home and workspace actually conserve water and energy with its water harvesting and storage systems, its “cool roof”, a triple wall insulation system and the use of Energy Star rated appliances, fixtures, and heating systems. The shading system is also extremely innovative as it reduces 50% of the solar heat conducted and in conjunction with the a 20’ high outside living space, known as the solar breezeway, the residence will only continue to become increasingly more sustainable. Perhaps the most impressive aspect of the home is the cost of construction. 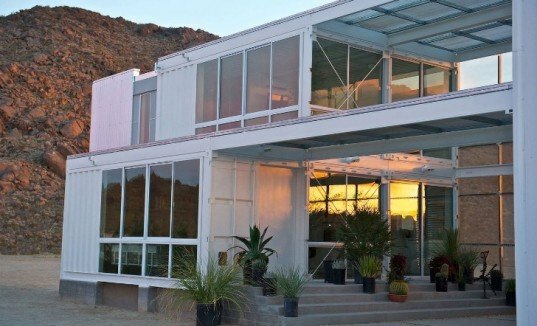 The breath-taking container structure, including footing and sitework expenses, cost just $150 per square foot – and the project was approved in just one week, whereas the typical housing project approval process in San Bernardino County, California usually ranges from one to three months! The project opens the door to homebuyers looking for something different from the standard manufactured home and allows for custom construction with a price tag that until now was nowhere to be found. This is awesome. Thank you, eco, for paving the way to the difficult process of meeting CA's standards for permit. Youre the one with the brinas here. Im watching for your posts.